The only North Korean held in Malaysia in connection with the death of Kim Jong-nam has been deported. Ri Jong Chol had been released from police custody due to insufficient evidence to press charges. He was handed over to immigration officials for deportation because he has no travel documents, and left the country on Friday, an official said. Malaysia is also investigating a firm thought to be used by North Korea to evade sanctions on military exports. It has condemned the use of the powerful VX nerve agent in the 13 February attack. 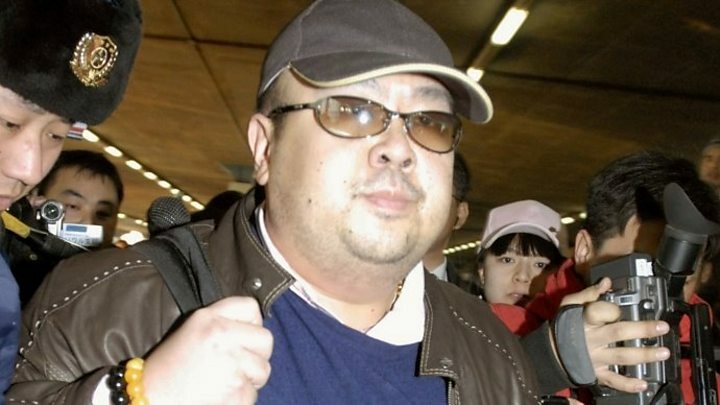 Mr Kim, the estranged half-brother of North Korean leader Kim Jong-un, died at an airport in the Malaysian capital, Kuala Lumpur. Two women were charged on Thursday with killing him by smearing his face with VX, a banned chemical weapon. Doan Thi Huong from Vietnam and Siti Aisyah from Indonesia have said they thought they were taking part in a TV prank. They have yet to make a formal plea in their case. Malaysian police chief Khalid Abu Bakar denied that any political or diplomatic pressure had been applied in the case and said the North Korean had been released because of lack of evidence, AFP reported. Ri Jong Chol had lived in Malaysia for three years but, according to Reuters news agency, his work permit expired on 6 February 2017. Immigration director-general Mustafar Ali said Ri Jong Chol, who was escorted out of Malaysia by two North Korean embassy officials, is blacklisted from re-entering the country. According to a confidential United Nations report, Glocom is run by North Korea's top intelligence agency to sell military communications equipment, in violation of UN sanctions. The Malaysian authorities say they have already shut down two local companies associated with Glocom. Malaysia is seeking seven other North Korean suspects, including an embassy official. Media captionWhy was North Korea's Kim Jong-nam killed? It has not yet confirmed that the body is that of Kim Jong-nam, acknowledging him only as a North Korean citizen. Mr Kim was travelling using a passport under a different name. Video Why was North Korea's Kim Jong-nam killed? Video Who killed Kim Jong-nam? Kim Jong-nam: Who in North Korea could organise a VX murder?